From ancient times to the rise of civilisation, it was not a common practice to consume beef. However, the culture of eating beef somehow managed to take root in Yokohama after the opening of ports. The start of the Meiji period saw the building of many slaughterhouses as the culture of eating beef began to spread. In 1868, a shop called “Ota Nawa Noren” opened in Yokohama and sold their first “Gyu Nabe” (beef pot dish), where beef was cooked in miso. This dish became very popular among the common people and the elites of Edo (current day Tokyo). This led to hundreds of “Gyu Nabe” shops opening all the way from Yokohama to Tokyo. Taking inspiration from “Botan Nabe” (wild boar pot), we refined the dish by adding sauce to the miso to make it easier to cook, and including leeks to remove the beef smell. 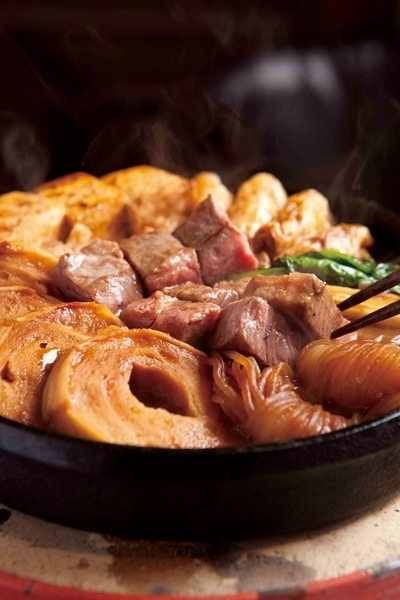 The pot used for this dish is made from thick cast iron, hence the name “Yakitetsu” (cooking on iron). The flat round shape of the pot ensures that heat is spread evenly throughout so that the sauce is well absorbed by all the ingredients. As for the sauce, it is made from “Edo Ama Miso”, a miso well-liked for its sweetness. The whole pot filled with beef, vegetables and tofu is slow cooked over a fire, becoming our signature Edo style Yakitetsu. The fragrance from the deeply steamed glossy brown soybeans, blends harmoniously with the sweetness of rice malt, forming this Miso which has a unique sweetness. This miso has the same sweetness as the Kyoto White Miso, but half the salt content of normal miso. During its peak (Edo to Taisho period), this was a popular item which accounted for 60% of Tokyo’s demand. Using Nanbu Tekki (南部鐵器) which has been assigned as Number 1. Iwachu is the top manufacturer of Nanbu Tekki (南部鐵器) who keeps the traditional techniques in its integrated production method, for more than 110 years since its establishment in 1902. Gentleness in this traditional steel plate. The more you use it, the more you will fall in love it. Although this is a traditional and old craft, it is still being used in this modern times.